A producer has a network of domestic and international dealers, and uses these dealers to market its products. Customers are either individuals or institutions. To receive a product, and eventually use it, clients sign a form, and follow a set of instructions. Clients need technical support and assistance. The dealer, however, is not always the best source of technical information. To each helpdesk supervisor corresponds a manufacturer specialist managing all interaction aspects with one or more dealers. 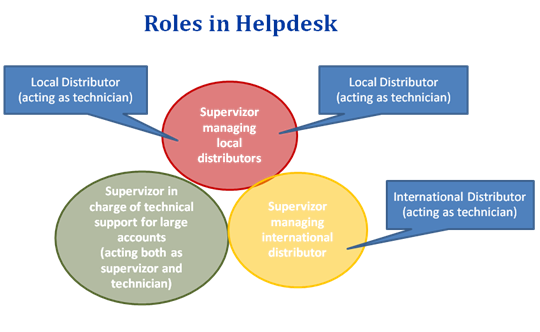 To each helpdesk technician corresponds a dealer representative. To each helpdesk client corresponds a customer in a business relationship with a dealer. Create categories for client problems, and create the set of fields comprising the client ticket form. The fields in the ticket form are related to the list of products and how the products are used. Set an email address for automatically receiving helpdesk tickets. Connect problem categories with technicians to automatically assign tickets to technicians. In this case, depending on ticket priority, you will have to define the ticket resolution time limit. Technician’s ability to close a ticket is easily assigned or revoked. When ticket closing ability for a technician is revoked, only a supervisor can close the ticket.